Mr. Gibbel is a high-ranking member of the Chippie Chipmunks, and may very well be the group's leader. He apparently goes around to check up on other members of the Chippie Chipmunks, although he probably has other duties as well. Mr. Gibbel is never seen without his Chippie Chipmunks outfit and Secret Chippie Decoder Ring. Mr. Gibbel arrives at Mario Brothers Plumbing, where he is greeted by Mario, who introduces him to Luigi. Luigi asks Mr. Gibbel as to why he came, and he explains that Mario is only five points away from becoming Chipmunk of the Month. Luigi then inquires as to what Mario has to do to earn these additional five points, and Mr. Gibbel states that Mario has to perform nothing but acts of kindness towards others for the following twenty-four hours. Mario fears that he cannot last for twenty-four hours, until Mr. Gibbel reminds him that he would be awarded with his own Secret Chippie Decoder Ring. He then wishes Mario good luck, and leaves Mario Brothers Plumbing. Mr. Gibbel returns the following day, and Luigi informs him that Mario really deserves to win the Chipmunk of the Month award. 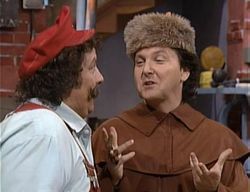 Mr. Gibbel then greets Mario, and explains to him as to why he came over. Mario is skeptical over the fact that perhaps he didn't qualify for Chipmunk of the Month, but instead Mr. Gibbel explains he had made a mistake, and that Mario originally had five points more than what was required to qualify for Chipmunk of the Month, making Mario's efforts to please Luigi seem like a complete waste. Mr. Gibbel then gives Mario his thanks, and tells him that he would receive his Secret Chippie Decoder Ring at an award ceremony the following week. This page was last edited on February 7, 2019, at 01:09.